Video On Fait Ensemble (2010). Courtesy the artist. A native of Kenya, Ato Malinda (born 1981) grew up in Nairobi, Amsterdam and the Unites States, where she pursued her undergraduate degree in Molecular Biology at the University of Texas, Austin. Her works consist of performance, drawing, painting, installation, video, and ceramic object-making. Through her diverse practice, Malinda investigates the hybrid nature of African identity, contesting notions of authenticity, as well as focuses on gender and sexuality. The VENICE INTERNATIONAL PERFORMANCE ART WEEK 2016 presents the video On Fait Ensemble (2010) about Mami Wata, an ancient African water spirit, who has been worshipped by Africans before the arrival of the Europeans but came into recorded history only in the 15th Century. It was recorded that at the sight of European ships, Africans associated water spirits with the Europeans. During colonialism in the 1880s, the famous German hunter Breitwieser, brought back a wife from Southeast Asia to Germany. Breitwieser's wife performed in Hamburg's Völkerschau (essentially human zoos), under the stage name "Maladamatjaute", charming snakes. The Adolph Friedländer lithographic company in Hamburg made a chromolithograph of the snake charmer, the original of which has never been found. However in 1955, this image was reprinted in Bombay, India after it had been sent to them from Ghana. It is still unknown how exactly the image got to West Africa, but it is thought to have been taken there from Hamburg by African sailors when they were in Germany. On its arrival in Africa, locals declared Maladamatjaute to be a resemblance to Mami Wata. The image has since proliferated throughout the African continent as Mami Wata, the snake charmer. On Fait Ensemble suggests in a metaphorical sense that this image came from the Europeans. This is done through the market performance of Papai Wata. 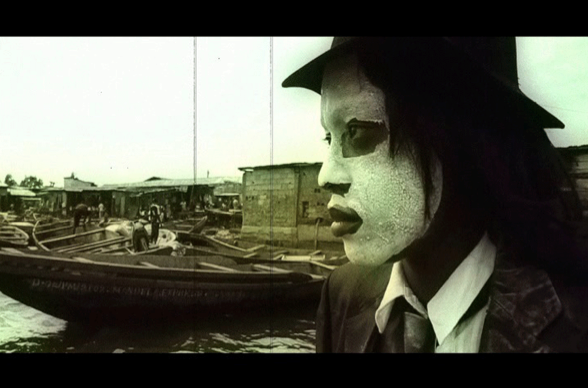 Papai Wata, who is the concomitant to Mami Wata in Beninese traditional ceremonies, symbolizes the European man and is depicted in the video by a white painted face.